"This didn't have great reviews and was selected on a "best of a bad bunch" basis, but actually it's great. Large, very comfortable rooms (if a bit chilly), great staff and personal service, and a very good restaurant. It's right up in the Cloud Forest, so very atmospheric, and only a few minutes' walk up the track to the Monteverde National Park." "Following Arenal Springs, this unusual hotel struggled to compare positively. The room was spacious, clean and comfortable with a separate seating area in bay window. The extensive wood panelling made the room seem very dark and the lighting was soft. The welcome was warm, the dinner was excellent and the convenient location for the cloud forest reserve was second to none." "A very environmentally friendly accommodation where there was a large emphasis recycling and saving energy. Walking distance from a natural reserve. Also, a short bus ride in to town. " "Very friendly staff. Very helpful in recommending and biking trips. Could be a little cold in the bedrooms." "Again we picked the hotel. We found the rooms a bit austere but OK if a little cold (we had to get a heater!). The hotel is convenient for MonteVerde national park but a $10 taxi ride out of Santa Elena but on a short stay this was not a problem"
"One of our favourites. Lovely staff, very accommodating. Because of the location we appreciated the fact that it had a comfortable place to spend the evening meaning we didn’t have to out. Lovely rooms with beautiful view of the cloud forest. It is worth warning future travellers that at 5000 ft it is cold and we were glad of our warm clothes." "Very far out of town so taxis were necessary to go anywhere and were expensive. Wherever you were picked up it cost $10 even for a mile or two. A regular hotel shuttle a couple of times a day would have been appreciated. But we had some wonderful tour experiences from this location in Monteverde. Even got to see the Resplendent Quetzal!" "Thumbs up •	Location : Great location for the cloud forest park. It's the closest hotel to the entrance and is easily within walking distance for repeat visits either to the park or to the little café at the park entrance where you can watch a multitude of hummingbirds at the feeding stations. This café is a golden location for any wildlife photographer. Thumbs down •	Location : Too remote for anything other than the cloud forest park. It's about a 30 minute walk into Monteverde for the local shops (Stella’s bakery) and requires a taxi to reach Santa Elena where the main shops & and restaurants are. •	Atmosphere : Apart from the bar & reception areas the hotel is beginning to show some signs of wear and tear and looks a touch dated. The rooms and corridors could do with a refresh to make them feel warmer and more welcoming. This is more noticeable than at other hotels as the weather here is often very windy and any gap in the window allows drafts and creaks to whistle around the bedrooms. Didn’t get very much sleep at all while here. A large section of the soffit outside of our bedroom(Room 11) had fallen foul of the winds at some point which exposed the rafters of the roof. Not a hotel that I’d hurry back to unless some serious refurbishment is done. " "Very nice hotel, but prehaps a bit isolted for familes from Monteverde town, meant you could not easily go out on evening, unless you have your own car, its a good 10 minute drive out of town. On the Plus side just a 15 minute walk from Monteverde reserve entrance and cafe with Humming Birds everywhere. Food in hotel was nice, as expected it was cooler here so a long sleeve shirt doe not go amiss. Totally recommend to do the Superman Zip lines and Tarzan Swing at 100% Adventura, extreme but amazing, Also the Hanging bridges tour at Selvatura was great we got to see a Tarantula and had a very good guide." 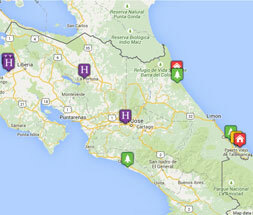 "The perfect location for access to the Monteverde Cloud Forest. Only a ten minute walk from the entrance - and its amazing hummingbird gallery. Huge room with its own garden room enclosed balcony. Very helpful staff when we decided to book additional activities. Multi-tiered gardens full of wildlife and with excellent views." "Disappointing. This hotel was suggested by Tribes, but only on our request for a cheaper hotel than the one they originally suggested so perhaps it was our own fault! The hotel looked lovely in the pictures - and had a great location, half a mile from the entrance to the cloud forest park - but the room was dark and had a very limited view, and the food was very average. The room was cold (though admittedly the outside temp was only 15-20C at the time) and we had to ask for a space heater in the room! We got wet and cold outdoors and could not dry anything in the room. The towels also stayed wet. So that probably coloured our opinion." "The hotel was very dark, very cold and soulless." "Fantastic. Loved the mountain room we were given and the staff. " "Spacious room, though rather cold; asked for space heater! Food 7/10 Guided walk of Curi-Cancha with guide Eric = good, but wet, windy, cold conditions – not ideal! (Impromptu walk to) Hummingbird café 1km up the road from hotel = fun – a bit touristy, but so many hummingbirds !" "We didn't feel that this place had much to offer us - the accommodation was quite basic, as was the food (albeit the portions were plentiful), the staff were ok but not as welcoming as at the other places we stayed. " "It was windy but you are at altitude and it's expected but the view from the hotel window was absolutely stunning. " "Hotel was very good. Really friendly and helpful staff. Disadvantage was being in the cloud forest, It was very cold with a strong wind blowing all the time. Absolutely no chance of being outside. Whereas a mile or two down the road there was no wind and sunshine. So given the chance stay a little lower down"